What a fantastic initiative. Some will say this is a crass attempt at milking (haha!) some extra marketing out of a powerful bandwagon. Not me! What better way to show our support for our boys than drinking our national drink out of a novelty black bottle? I suppose using the said milk as a mixer or chaser for your favourite alcoholic tipple down at the pub at 5am before work, whilst waving your NZRU trademarked silver fern flag would be up there... But the marketing practically writes itself: Man Milk, Richie's White Stuff, Dan Carter's Cream, Goes down a treat, Come on All Blacks, ... 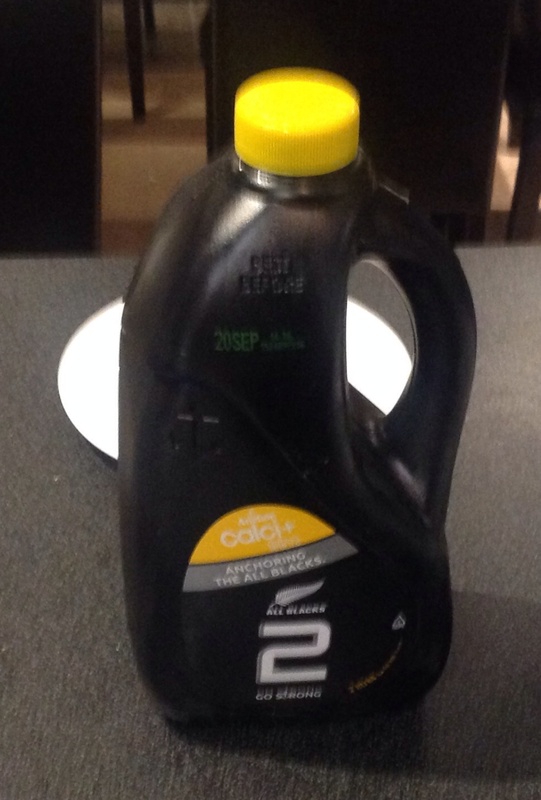 Though on second thoughts the All Black fan club president Mr John Key may have vetoed cream getting the black bottle treatment, given what he's on the record as saying about Gay Red Top. The only question remaining is, once the World Cup is over, will Anchor be able to go back to white bottles? Anyway, milk procured, I returned to my beverage. 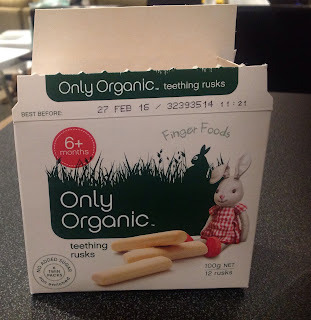 Feeling peckish, I looked around for a biscuit or cake, and my eyes settled upon Only Organic Teething Rusks. Emily is at the age that she's chomping through these. And don't the South Africans eat something similar with their hot drinks? Sure, it isn't Chanui Biscuits, New Zealand's favourite biscuits (TM), but could they come close? Full marks on describing iron as a mineral, Only Organics. Though the fact I guess there are no carbon molecules attached to this trace element I suppose makes it INORGANIC! I dunno, maybe it's in the form of iron polymaltose, or attached to some other complex sugar, which I guess would suit your company name. But if we're being this scientifically specific about classifications, why not clarify some of your other ingredients, eg Fungus (yeast)? First Impressions: A rather solid baked log. I tried to break this in half, and it required far more force than expected, but came apart with a satisfying snap. Half to Emily for her teething difficulties, half to Daddy for tasting. And herein lies my second first impression, my first equal impression if you will. Only Organic packs these in little sealed packets of two rusks, ten to the box. Why, when my baby, who is perfectly normal, can only manage half a rusk per sitting at most? Why not just ten loose rusks in a box? It's not like they're going to go off or anything? They're essentially crackers! 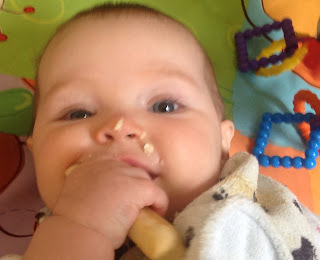 Emily's reaction: She loves these things, and will happily chew away whilst the rusk dissolves into a sticky mush and distributes itself over her clothing, into her hair, over her face, and usually over whichever parent is nearest. Today the half rusk lasted around half an hour. Bouquet: not a particularly distinctive nose on this one, perhaps as expected for a baked product with no added flavouring or sugar. Strong flour notes predominate, perhaps with an afterhint of yeast. Taste test: A sturdy biscuit we have here, in its raw form requiring quite a bite to break through. Use the premolars: I feel an incisor would likely be exposed to too much strain if you tried to snap a piece off this. A floury, slightly savory flavour predominates on the palate, but once dunked heartily in coffee, the baked taste of the ruck stands aside to allow the full benefit of java to be experience. The dipping in fluid does require a committed submersion, as I feel the toughness of this rusk would feature fairly highly on the Moh scale. Overall: 7/10. Whilst not as flavoursome as Chanui's all conquering cookies, not a bad alternative to accompany your morning tea break. Enjoy: with a hit coffee, with or without the milk of our fifteen finest men.